We all want to make our readers excited by what we write: That is why many authors are looking for writing advice and tips on how to engage the reader. It can be tricky to target your audience these days. The truth is, there is a lot of exciting written material out there, and there are a lot more ways to stay entertained with television, movies, music, and more. Why should a reader pay attention to you? Rise up and answer the question by taking control of what you write. You can command the attention of your readers by following a few tips of effective writers. When something grabs your attention, it is hard to divert your attention elsewhere. Sometimes, it is material that shocks us. Sometimes, it is because the theme or some specific information hits home with us in a very personal way. More often than not, grabbing someone's attention has nothing to do with what you write - it is related to how you write it. Some writers have the knack of making anything sound exciting and thrilling. This is because they have mastered the art of hooking people in to their writing. It seems like they know the kinds of phrasings that people respond to - and then they go out, write it down, and make it happen. Making yourself vulnerable as a writer is a key to being a successful writer. Dare to expose why you are personally invested in a topic and how it has affected you. Share your story - nobody else can tell it. Be flexible about sharing some details. You do not have to tell your life story in order to get people to listen - just share some information that is interesting and revolves around a certain topic. For example, if you were writing about ice cream, make it personalized. Writing like a robot can make even ice cream sound unappetizing. 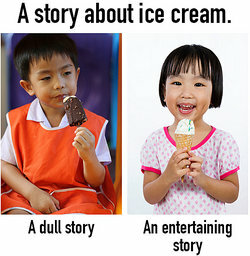 Nobody really wants to read an article that begins with, "Ice cream tastes great. Many people like it." Try something more personal: "The first time I took a delicious, creamy morsel of frozen, chocolately ice cream into my mouth, I smiled, and proceeded to eat the whole bowl." There are many tricks of the trade that never seem to get old. Try some out in your writing and see how your readers respond. Start with an alarming statistic. Many people become shocked by the facts and are interested to keep reading to learn more. Tell someone's important story. Begin describing another person's experience and expressing sympathy. Look at the following sentence: "She grew up learning how to speak English by watching movies that were smuggled into her country." It draws the reader in and gets them exciting to learn more about this individual and their experience. Perfect your writing style. Make sure that your first paragraphs are error-free - this will encourage people to keep reading what you write. The best writing advice is to keep writing, keep revising and keep asking for comments on what you write. By getting feedback from readers you will learn how to engage your reader and get them to pay attention to your words. "Writing Advice and Tips on How to Engage the Reader." YourDictionary, n.d. Web. 24 April 2019. <https://grammar.yourdictionary.com/grammar-rules-and-tips/writing-advice-and-tips-on-how-to-engage-the-reader.html>. We all want to make our readers excited by what we write: That is why many authors are looking for writing advice and tips on how to engage the reader. It can be tricky to target your audience these days. The truth is, there is a lot of exciting written material out there, and there are a lot more ways to stay entertained with television, movies, music, and more. Why should a reader pay attention to you?Rise up and answer the question by taking control of what you write. You can command the attention of your readers by following a few tips of effective writers.